Ranch History — Anderson Land & Livestock, Inc.
Knowing how difficult it was to purchase herd bulls that would hold up in the rugged terrain of McKay Creek, Terry’s goal was to breed and raise bulls that would thrive in all environments, even the roughest cow country around. First introduced to the idea 35 years ago by Ron Baker, Terry chose to focus his efforts on building the ultimate composite-breeding program. After all, he didn't want these bulls to just survive in real ranching environments , but thrive while producing offspring that benefited from superior growth. Red Anderson resting on an original gooseneck equipped with a water bag. Rod & Terry overseeing the winter hay storage operation. Terry giving Rod & "Dean" instruction on proper horse training and cattle handling. 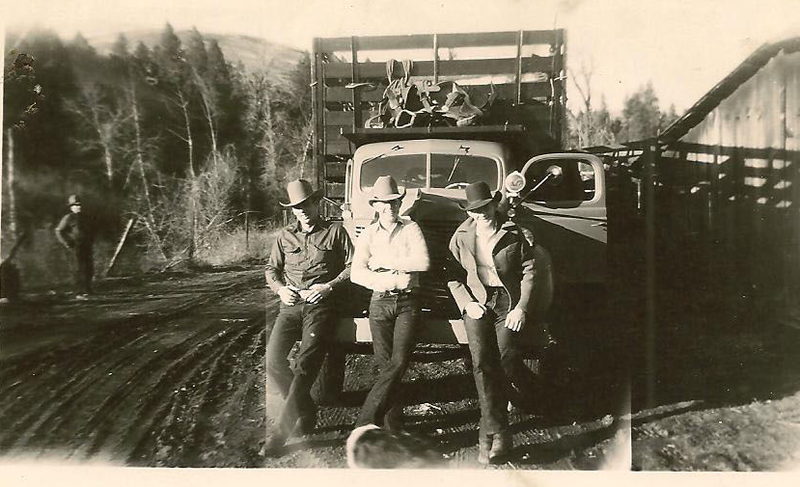 The Wild Horse Runners, Left to Right, Numa McCoin, Bun Anderson & Red Anderson. "The Men from Snowy River"
Red & his brother Don, were convinced their future was in prize fighting. The original 4 wheel drive system of dispersing salt.